How to use Details view control in ASP.NET? 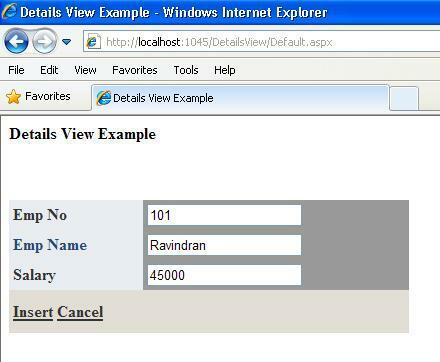 In this article I am going to explain about Details view control and its uses with example. In this resource example I cover all insert, edit, update and delete record details through details view. Mostly we are used details view control to view all details of single record in a one page. 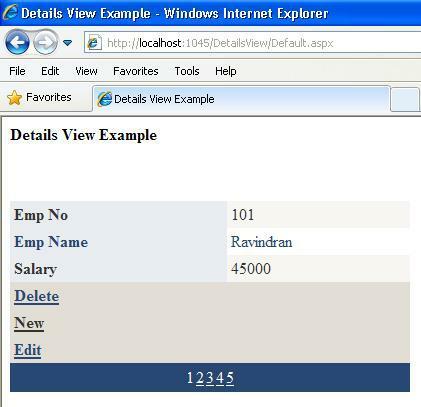 Details view control is same like other data control, it is also used to display record in the web page. 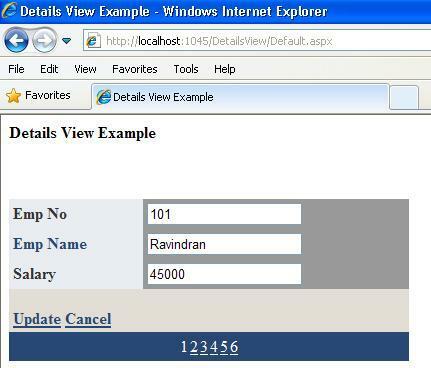 In this control records are displayed with details in vertical format. Each record display in single page mean if you assign 10 records as DataSoure then 10 Details view paging is occur. In this article I have explained in detail about Updating / Deleting records through Details View. Consider below example how to bind data in the details view and also how to manipulate Data Edit, Update, Insert and delete operations. Initially i have load data from database to details view, each records are displayed in details view each page. After User click Update button to Edit and update selected record details. If click Add New Button then able to add new record in the database. &LT;asp:DetailsView ID="DetailsView1" runat="server" Height="50px" Width="400px" AutoGenerateRows="False"
In the code behind i have manipulate insert, update, delete operation code and query details. I hope this article is help you to know all Insert, update and delete through Details view operations. Can you please explain when can I use stored procedure? How to implement the edit delete insert in detailed view?